(CBS News) The World Health Organization announced on Tuesday that there have been 15 cases of the Ebola virus infecting humans in the Democratic Republic of the Congo, causing 10 deaths. The 13 probable and two confirmed cases in Province Orientale in the eastern part of the country have medical officials concerned. The viral infection has occurred in three health zones, and the deaths have included three health care workers. The announcement of the 10 deaths was also confirmed by Medecins Sans Frontieres (MSF), known in the U.S. as Doctor Without Borders. They added that they believe there are another six confirmed or probably cases in the town of Isiro, the BBC reported. Ebola hemorrhagic fever (Ebola HF) is an infection caused by the Ebola virus, according to the Centers for Disease Control and Prevention (CDC). It's named after a river in the Democratic Republic of the Congo, where the disease was first found in 1976. There are five types of Ebola virus: Ebola-Zaire, Ebola-Sudan, Ebola-Ivory Coast, Ebola-Bundibugyo, and Ebola-Reston, which has only been found in non-human primates. Ebola symptoms include fever, headache, joint and muscle aches, sore throat, and weakness, followed by diarrhea, vomiting, and stomach pain. Sometimes rashes, red eyes, hiccups and internal and external bleeding may be observed. The virus is passed through direct contact of blood and/or secretions from an infected person. The incubation period for Ebola HF is two to 21 days, and symptoms manifest rather quickly. Because there is no direct treatment or vaccine for the disease, it is often deadly. However, in correctly diagnosed cases, patients can receive supportive treatment to make sure their fluids and electrolytes are at appropriate levels, to help maintain their oxygen status and blood pressure, and to help manage any complicating infections. In late July, WHO officials announced that an outbreak of Ebola virus was taking place in nearby Uganda. The disease was under control by Aug. 3, when a list of 176 people who had even momentary contact with those who contracted Ebola was created and other precautionary measures were put in place. The strain that infected the Ugandan people was known was the Sudan strain. However, the MSF told the BBC that they believe the particular strain of Ebola that is infecting people is known as the Bundibugyo strain, which means the two outbreaks are possibly unrelated. Although it is not as deadly as the Sudan strain, it is still very worrisome. "It is normally less mortal and less virulent then the one we have seen in other places... But still it stays a very dangerous and mortal disease... we expect normally figures around 25 to 35 per cent mortality," Anja de Weggheleire, medical coordinator for MSF, said to the BBC. 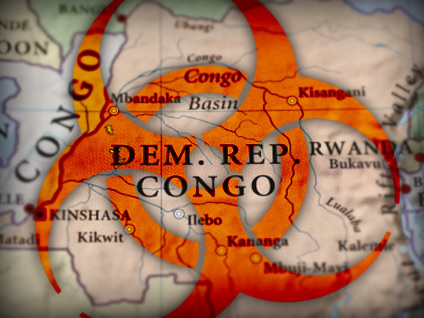 The Congolese Ministry of Health has created a National Task Force and is work with several health organizations including WHO, UNICEF, MSF Suisse, MSF Belgique and CDC to control the outbreak, according to the WHO. An emergency response team has been put in place, and the WHO is taking care of organizing information and research about the ongoing epidemic as well as public notification.